The Lewis T. and Maxine Porterfield Scholarship recently reached award level and will begin providing an annual scholarship for an Agriculture student in the 15-16 school year. Additional contributions will increase the amount provided to a student each year. 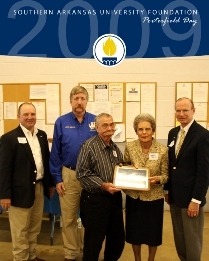 The endowment was established by friends of the Agriculture Department during Porterfield Day in October 2009. Over 250 people attended the event to recognize the Porterfields for their service to Southern Arkansas University. Lewis Porterfield managed the University farm for more than forty years, and Mrs. Porterfield served in several offices on campus.